Posted on November 17, 2014 by Financial Underdog	in Uncategorized. Just the other day my wife and I were having a discussion. Out of the blue, I asked her – is there anything you’d consider buying if it meant borrowing money? After thinking for few minutes, she couldn’t come up with anything. 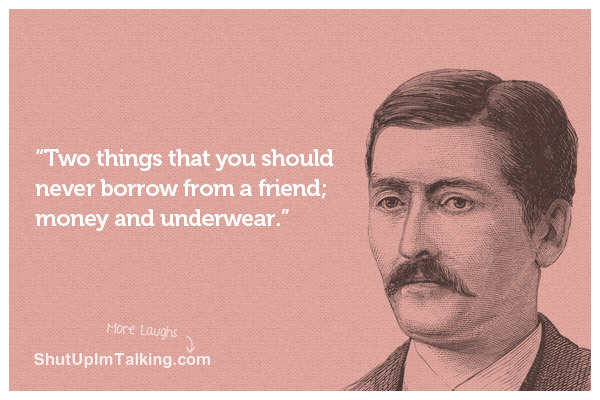 And then she asked – why would we ever borrow money for “stuff”? She is a smart cookie. Much smarter than me, I fully admit. After all, I’ve borrowed money before and got into all sorts of trouble because I couldn’t control my borrowing and spending. I’ve had collection agencies call me several times a day and demand payments. I’ve worked two jobs with no days off to pay them off. I ate copious amounts of noodles with tuna to save every penny to pay them off. I’ve sold virtually everything I owned to pay them off. And it’s not like I’ve borrowed money to do something cool – my borrowed money went into school I didn’t even finish and “things” I just had to have. Oh, the insanity! I want to go back in the past and slap myself for doing it. It actually hurts to think about how stupid I was with borrowed money. 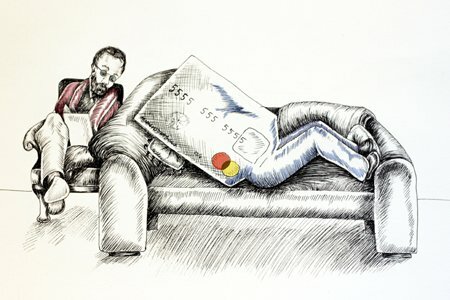 After paying off all my debts and becoming a new and improved me, I shudder when I think about borrowing money. This is probably what heroin addicts think after going through hell and back, giving up the drugs, starting to enjoy clean life and gaining support … and then running into a situation which reminds them of their dark past. Somebody mentions borrowing money for something … and I go into rage. Why? Why!? WHY?! No, never again. Not even once, not even ever. I’d rather drive a car with no power windows for the rest of my life then borrow money for shiny new wheels. There’s not a single car in the world worth borrowing money in my mind. Decent 3-4 year old car will get you everywhere hassle-free just like a brand new car. Get someone else to take a hit on crazy depreciation, and scoop it up for cash at much reduced price. School loans? No, thank you. My wife right now is going through school, and borrowing money was an option for her. Instead of borrowing money, we’ve decided she’ll complete her degree part-time while both of us work and pay for her school in cash. We bankrolled every course she had to take. She’s two courses away from completing her designation – and no school loans. When our family income increases it will all go to us, not some bank. Was it hard? Heck yes. Was it worth it! Absolutely! New furniture? Fancy TV? Renovations? Not worth borrowing money. When was the last time new furniture changed our lives? Our TV sits unused for the most part anyway. No, we’ll never borrow money for anything of this nature. When you never borrow money, your life is easy. You don’t have payments to worry about. You paycheck is yours to keep and you don’t have to immediately give up a portion of it. You are no longer forced to work in crappy conditions just because otherwise you wouldn’t be able to afford payments on your “stuff”. You can sleep well at night instead of calculating upcoming payments and bank balances in your head. Your life might have less stuff, but it feels more enjoyable because you owe money to nobody. Never borrow money, and live your life on your schedule, not debt repayment schedule. Housing is a good example of when it’s ok to borrow money in my mind. You can’t save money for a house, it would just take way too long. Real estate if pretty pricey with average house touching on $450,000 in our area. It would take years to save. At the same time, real estate generally increases in value making real estate borrowing fairly safe. Consumer “stuff” on the other hand tends to go down in value. We’ve borrowed money to buy our home. But even then we tried to do it the smart way by buying when prices went down significantly thus getting more bang for our buck. Also, we’ve put down 25% as downpayment which reduced our cost of borrowing since we didn’t have to buy mortgage insurance. And we also borrowed for our home at a very low interest rate (under 4%) and will probably reduce it even further when we have to refinance next year. But other than that… I’m confident when I say that we’ll never borrow money (again). How do you feel about borrowing money to become an entrepreneur, such as starting a beer brewing company in Victoria B.C.? Borrowing for investing into less risky things such as established dividend paying companies and hoping to make money on the spread between borrowing and ROI – this idea has some merit, but still. Right now I’m looking into Smith Maneuver – this idea has some merit too, I think and is inside of my comfort zone.